It was Halloween night, 2014. Brianna Bosley, 18, a studio arts major at the University of Arizona in Tucson, was planning to attend a party with friends. Some 100 miles to the north, in Scottsdale, Arizona, Dave Patel, M.D., a Mayo Clinic ophthalmologist, also was getting ready to celebrate Halloween with his 10-month-old son, something he had long-planned with his family. And he had made a pledge to not be a slave to his cell phone that night. Neither Brianna nor Dr. Patel knew their lives would soon intersect – in a profound and dramatic way. Brianna was vigilant about her eye health, given that she has juvenile glaucoma, caused by a condition called ocular hypertension. 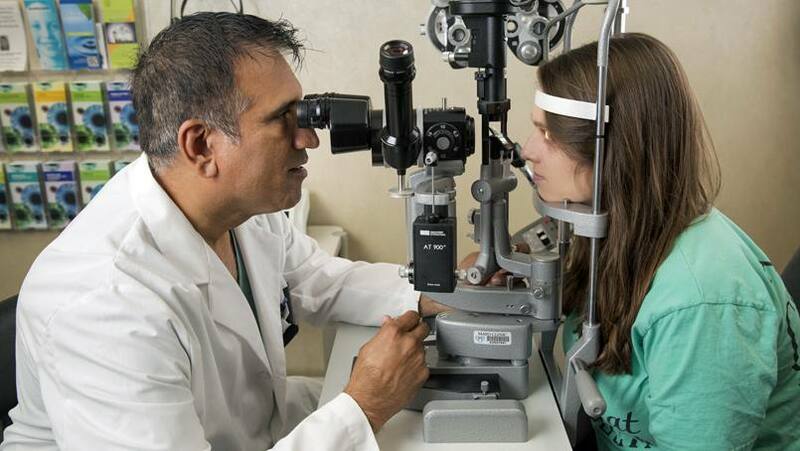 She requires careful monitoring by her eye doctors, since pressure in her eye that climbs above the normal range can cause damage to her optic nerve. And that could lead to loss of vision. During the afternoon on Halloween day, Brianna, accompanied by her mom, Donna, visited her Tucson ophthalmologist's office for a pressure check. Following the appointment, they were planning to drive to their family home in Phoenix, because Brianna's artwork was going to be displayed at the Arizona State Fair the next day. The technician tested Brianna's left eye. She paused, and calmly said, "Let's do that test again." Again, she did the check. Then she did it a third time. This time, she left the room quickly to summon the physician. Eye pressure measuring 30 is concerning. In Brianna's case, her eye pressure that night was 70 – a crisis point. It was near closing time, but the physician told Brianna and Donna, "We're not going anywhere." Time was of the essence to save the vision in Brianna's left eye. It was imperative that they find a specialist to do complex surgery, called a canaloplasty. Meanwhile, Brianna had to face the news that she might be blind in her left eye by morning. "I knew I wasn't in control," says Brianna, "So I just prayed that something would come up." Then it came to the physician: "Dave Patel at Mayo Clinic!" Dr. Patel's cell phone lit up with messages from Brianna's physician in Tucson, who Dr. Patel knows and respects. Despite his vow to overlook cell phone messages, he told family members, "I have to take this call." As it turns out, Dr. Patel's was at a Phoenix emergency room checking on his father, who had been admitted that night, when the call came. Once Dr. Patel was assured that his father was stable, he agreed to help Brianna. One of his first calls went to Robyn Tolboe, his loyal ophthalmic tech. She sprang into action, hurrying to Mayo Clinic's campus in Scottsdale, where she collected the instruments required for Brianna's surgery and transported them 14 miles to Mayo Clinic Hospital, where she secured an operating room. The frantic drive to Phoenix remains a bit of a blur to Brianna and Donna. But they made it. When Dr. Patel met them, he said, "Sorry we have to meet under these conditions." Dr Patel was up front about the severity of Brianna's condition, she says. "He was honest with me," says Brianna. "He said I was high risk because of my eye pressure and the possibility of hemorrhaging. I could go blind. There was a chance I would not have the career I wanted as an artist." Still, Brianna added, "I trusted everyone. Brianna and her mom recall Dr. Patel saying, "I am going to go for Plan A. But you need to know we might end up with Plan C or D." It would be delicate surgery, he explained, with the desired outcome being to relieve the extreme eye pressure. By now it was close to midnight. Brianna opted to not have general anesthesia, so she could be aware of what was happening in surgery. She recalls Dr. Patel being extremely focused and calmly giving her updates. To everyone's relief, all went well, and Brianna stayed at Mayo Clinic Hospital overnight. The next morning, Dr. Patel came in and removed Brianna's eye patch, clearly pleased with how she was progressing. "He was happy and sent me on my way home," Brianna says. This past summer, Brianna and Donna were in Dr. Patel's office for a follow-up exam. Dr. Patel – this this time with plenty of notice – had operated on Brianna's other eye on May 27, to remove the pressure before it became an emergency. Brianna was healing well, and looking forward to progressing with her passion: art. Brianna's mom has taken on a cause to make a difference for people with Brianna's eye condition. She plans to start a foundation to provide Dr. Patel resources for training others to research ocular hypertension and to ultimately find a cure. "Dr. Patel is a great surgeon and a great person," Donna says. "He so willingly gave of himself for us, and continues to do so."